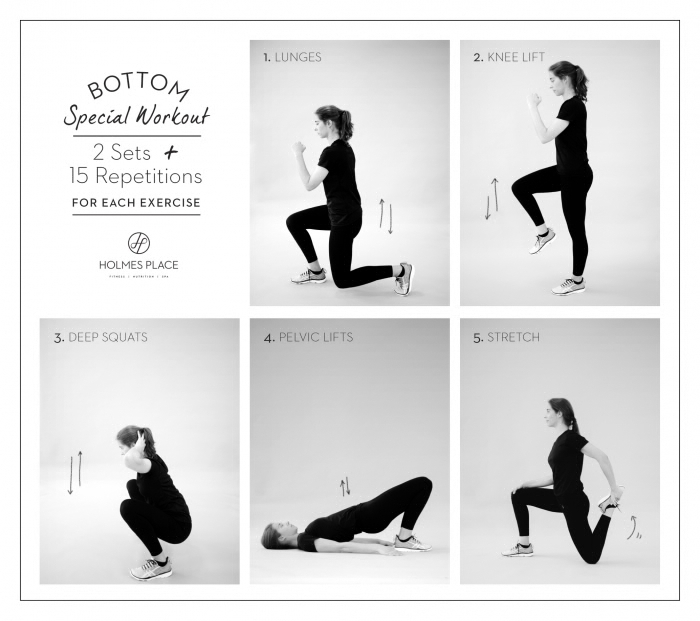 The bottom is one of the most common focuses for workout routines and there are several exercises you can do to tone these areas. See our special workout for legendary legs here. Gluteal muscles that compose the buttocks are divided in three: gluteus maximus, gluteus medius and gluteus minimus. This structure is what allows rotation of the hip joint, abduction and extension movements. To shape these muscles, you should perform diverse workout sets, while making sure to avoid using the same exercises time and time again. The gluteus maximus is the most superficial of the three and it’s the one that most defines the shape and tone. To train your glute muscles, you should chose machines, weights and gym equipment as these are large muscles and so results are harder to obtain if there is no equipment involved, that generate an extra push. Here are some of the best exercises you can do to shape up your bottom and work on all three sets of muscles with different strategies. With the aid of the right machines, you’ll be strengthening your muscles while simultaneously toning and shaping them. If you chose to combine these with fat burning aerobics solutions too, it will promote weight loss. The equipment you can use at your club will isolate the muscles and focus on effort and repetitions. 15 sets x 2 repetitions. 7 sets x 3 repetitions. Note: For extra efficiency use wrist/ ankle weights.